Europe has an endless array of things to do and see any time of the year, so Goway has eased the selection process a bit with a list of 10 recommended UNESCO World Heritage sites to visit on the continent. Each can be seen as part of a Goway tour program. “We are seeing travellers becoming more conscious of their global footprint and looking for deeper, more educational experiences,” Craig Canvin, VP Product Europe for Goway. One way that travellers can do this is by incorporating UNESCO World Heritage sites into their itineraries, he says. UNESCO designates cultural and natural sites of significant importance to humanity as part of its World Heritage list. To date, the agency preserves 1,073 World Heritages sites in 167 countries. Amongst those chosen by Goway are Mont Saint Michel in France, The banks of the Danube and Buda Castle in Hungary, the Giant’s Causeway in Northern Ireland, Vatican City in Rome, the Western Norweigian Fjords in Norway, the Alhambra, Generalife and Albayzin in Spain, the palaces and parks of Berlin in Germany, the Trulli of Alberobelo coastal regions in Italy, the city of Bath in England and the Acropolis of Athens in Greece. 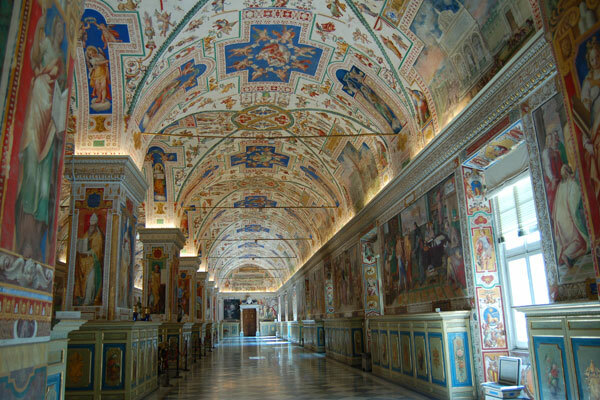 Pictured, one of the eye-popping, art-laden hallways in the Vatican, Rome.